HEPA filters for Usage Zone with high temperature requirements up to 260 C for exhaust air & 385 C during peak 1 hour. High Temperature Filters are available with either a gasket or fluid seal. We also manufacture 65% efficiency Hepa down to 0.3 Microns. Glass Fibre Media in 15 mm thickness capable of withstanding up to 300 deg. C.
Filtrowin offers deep pleat box type filters for high temperature applications. Filters are available and in HEPA range. 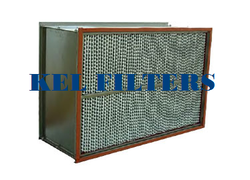 Filters are silicon free and can withstand upto 385° C.
- Suitable for use up to 250 Deg C operations. 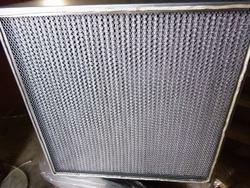 - Multiple layers of Stainless steel or fibre glass mesh or fibre glass tissue are used as filtration media. - Casing is usually stainless steel. - Silicone sealants used to seal casing to media pack. - Suitable for use as pre filters in paint baking ovens and dryers. The IHT 1000 is an extended surface, high temperature filter design with rigid construction. The filter utilizes a glass media that is pleated in construction. High Temp Oven Filter – EEC high temp. Filter made of glass fibre media in flat fitment, pleated & rod construction, can stand up to 300 deg C.
Wide range of PTFE Coated Glass Fiber Fabrics and Tapes of excellent mechanical strength in different thickness. These fabrics and tapes am also available with one side pressure sensitive adhesive with or without release paper.